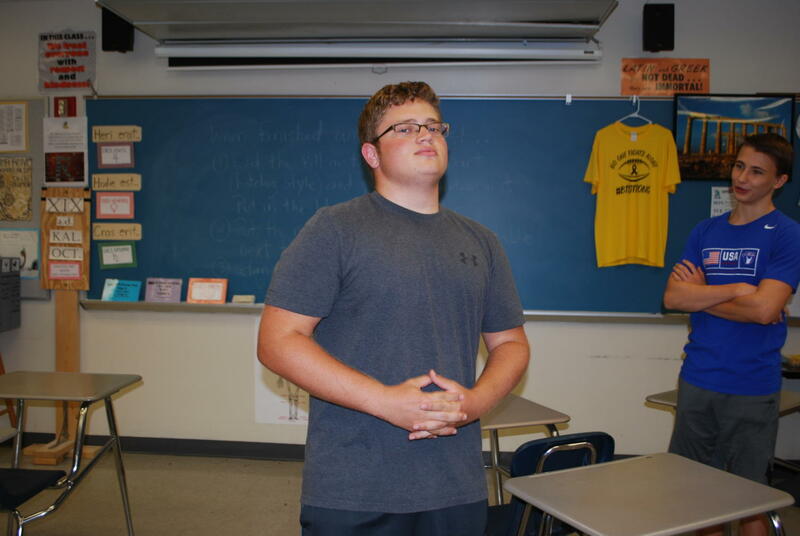 On Sep. 19, junior Aiden Stein goofs around in his Latin 3 class. The class is all about ancient history, so they don't shy away from silliness. As students quickly get to their seats in the Latin teacher’s room, a recording of triumphant horns sounds throughout the room. Students can hear the popping of popcorn, and a travel video featuring Rick Steves being played on the projector. These sounds are familiar to all of the Latin Club goers. Latin Club is a gathering sponsored by Latin teacher Robert Payne. Latin Club occurs every other Friday from 2:30 p.m. to 3:30 p.m. A few of the activities students participate in are: games, watching movies, eating food, and spending time with the roughly 15 classmates that attend each meeting. The club is not exclusive to those who take the Latin class, but instead welcomes any and all students. However, students who do not take the class may feel left out when students speak the language or reference inside jokes within the class. There are no official officers, and Payne is the only teacher sponsor. While the club usually runs on a standard schedule for the meetings, it occasionally breaks from the mold and brings new types of activities into the club. A recent favorite of the students is Bingo, where the club uses Roman terms to review Latin educational material in a fun way. The winner of each game of Bingo wins candy of their choosing, since food plays a key role in the club. or in assorted Latin decorations, such as a cardboard “Hades’ Gate”, and multiple stuffed animal “Cerberi”. Overall, the club is tons of fun. After a long, tiring week in high school, a relaxing break from the stress can be a great way to finish a the week. Latin Club is exactly that stress relief students need. Latin Club is not formal and serves as a great place to enjoy Roman culture, eat as much food as possible, and build relationships with other members.